Enjoy your vacation in Costa Rica visiting our beaches, mountains, volcanoes, rivers! All the while enjoying the natural scenery and embarking on various adventures. All this and more is included in the Pura Vida Costa Rica Tour Package. Take advantage of our special rates during the year and enjoy on your next trip to Costa Rica the natural beauty of this beautiful country full of biodiversity. Thinking about the most important and the most beautiful turistic places in the country we include in this vacation package: San José, Canals of Tortuguero, Cahuita or Puerto Viejo in the South Caribbean of Costa Rica, Río Pacuare, La Fortuna and Arenal Volcano, Monteverde Cloud Forest and Manuel Antonio National Park. Arrive to Costa Rica and we will transport you to your hotel in San José. We’ll be waiting for you at the exit to the airport with a sign with your name to take you to your hotel in San José. We will give you all the documents and relevant information that you will need during the duration of your trip. Depending on what time your flight arrives, you may have time to see some of the city; walking and visiting different locations of interest that Costa Rica’s capital has to offer. Early in the morning--around 6:00 am--we will pick you up from your hotel to start your tour at Tortugero National Park. Tortuguero is a remote destination, but a jewel of natural beauty that you cannot miss on a trip to Costa Rica. Tortuguero is an internationally important wetlands system in the Caribbean zone of Costa Rica. Beautiful flowers and fauna adorn its natural splendor. In the months of June through October the excitement is further augmented by the visit of the green back turtles that flock to the region. Wake up in one of the richest areas of biodiversity in Costa Rica and observe the monkeys and migratory birds while you take an excursion through the famous canals of Tortuguero; although not before having your tasty typical Costa Rican breakfast. At 11:00 am you’ll ride anew on the boat to get to the micro-bus that will transport you to your next Caribbean destination—Cahuita or Puerto Viejo, depending on what you decide. Here you will enjoy the majestic beaches and be surrounded by nature in the relaxed environment that the Caribbean is famous for. This is a rest day to lie out under the palm trees or plan your own adventure to get to know the area better. There are plenty of available excursions in both areas. Beautiful paradise like beaches with Caribbean flavor just waiting for you to explore them. White water rafting on the Pacuare River and then transportation the La Fortuna/Arenal Volcano area. Very early in the morning--around 6:00 am--we will take you to the Pacuare River to live out an extreme adventure on one of Costa Rica’s most famous world class rapids. The Pacuare River is the #1 option for adventure lovers who also want to take in the natural beauty of Costa Rica. Expert, experienced guides will be with you all the way down the river. After your rafting excursion and a filling lunch you will climb back on the microbus to take you over to the Arenal Volcano area to the hotel of your choice. Arrival time is around 6:00 pm. Perhaps the most famous Volcano in Costa Rica, Arenal and its nearly perfect cone shape adorns the sky on clear days. From all around La Fortuna and the surrounding areas the volcano stands out on the horizon, providing breathtaking panoramic views. Until recently Arenal was one of the most active volcanoes in the world. In recent years the volcano has fallen dormant, but volcanologists affirm that it could wake back up at any moment. You will hike in the Arenal Volcano National Park, walking over top of now cool lava flows. Additionally we will visit the La Fortuna Waterfall and later in the day relax in the hot springs. Naturally heated by Arenal Volcano the hot water springs forth from underground reservoirs to provide a delicious and relaxing experience as you chill out in its not so chilly waters. Travel to Monteverde by way of Lake Arenal. At 8:30 am we will start our journey to the Monteverde Cloud Forest, by way of the quickest, most scenic and convenient route between these two must visit destinations: crossing Lake Arenal. After three hours of travel you will arrive directly to your hotel. The dense mist gives a unique ambiance as you enjoy the Monteverde region. The ever-present clouds give a mystic aura to an environment that is teeming with life. 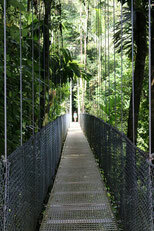 It is here that at 1:00 pm you will hike for about two hours along the trails and hanging bridges of the Selvatura Park. Birdwatching in Monteverde and traveling to the Manuel Antonio National Park. You will have the unique opportunity to observe the birds of the Monteverde Cloud Forest. From about 6 am to 8 am you will hike along trails through clearings to observe the great variety of birds that abound in the forests of Monteverde. Afterwards we will take you to Manuel Antonio National Park, known as perhaps the most beautiful of all of Costa Rica’s national parks. You will travel comfortably in an air-conditioned microbus for about 3.5 hours. Upon arrival you can rest and relax. This day is dedicated to relaxing on the beach and visiting Manuel Antonio National Park and its paradisiacal white sand beaches. This park’s dense forests are teeming with life; alongside the forests are some of the most beautiful beaches in all of Costa Rica. The coastal areas are great for swimming or just relaxing and watching the birds and the monkeys that are always keeping you company inside the park. The white sand, palm trees, and ecologically protected bay make Manuel Antonio Beach a fantastic experience that we’ve included at the end of your trip to make your vacation dreams a reality. Pura Vida Costa Rica!! Until the next time. In accord with the return flight information you provide us with, we will make your transportation arrangements to make sure that you arrive at the airport on time after having seen the best Costa Rica has to offer with this Pura Vida Costa Rica Tour Package!